Musty odors inside a home are an indication of a mold or mildew colony growing in the crawl space below the floor. Mold and mildew are fungi which are perfected adapted to grow and spread in environments which have excessive moisture, humidity, as well as wooden materials for the fungus to feed and grow on. If your basement or crawlspace was not originally properly prepared to deflect moisture in the dirt and soil, then your house could very well experience the growth of mold and mildew. Mold is a known health risk fungus which colonizes wooden supports and floor joists in your crawl space or basement. As mold spreads, it shoots spores into the air. These spores spread into your home’s air. Studies indicate that nearly half of the air in your home originates from the space below it. Thus most foundation repair companies feel it is critically crucial to address the problem in a timely manner as the fungus is widely known to be the cause of many common health problems such as asthma issues, skin rashes, fatigue and headaches. We can easily control moisture levels in your basement or crawl space with a dehumidifier system. Dehumidifiers are a simple and reliable solution because a water-free crawl space is a healthy crawl space. 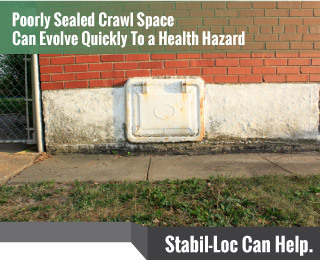 By removing moisture and humidity, mold will not be able to grow in your crawlspace. You’d be hard-pressed to find a more professional and reputable foundation repair company in our city. Our work is guaranteed and our staff is licensed and insured. Contact your local Authorized Stabil-Loc Dealer right away to schedule a free, no-pressure, no-obligation repair estimate.